Can commercial architecture be beautiful? Absolutely. And my clients ENB Architects are some of the best around at achieving the perfect balance between aesthetics and practicality. One recent example is the stunning rehabilitation of the Florida East Coast Railway Building in Jacksonville. As you’ll see in my photography below, they preserved this former repair facility’s history while turning it into a usable and appealing office space. 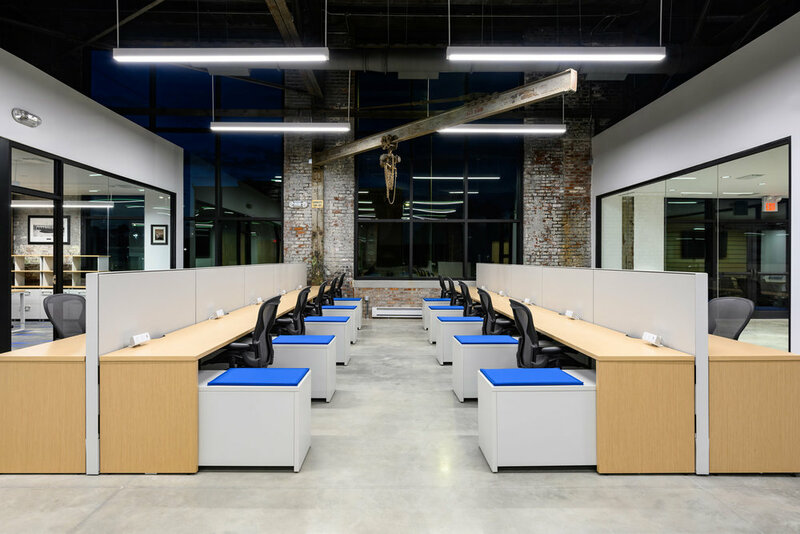 From the exposed brick walls and formerly functional cranes to the antiques used in decorating the offices, the entire project is a living history lesson. And check out the trellis over the coffee-break area. Those are actual steel rails from a once-active line. As with all my twilight images, this composite required shooting a series of frames over the course of about 30 minutes: some earlier ones to capture the detail in the brick, and some later ones to capture the right level of illumination in the sky and allow the interior light to shine out through the large windows.